In “Vision Disturbance,’’ with Linda Mancini and Jay Smith, the lines between the healer and the patient often tangle. 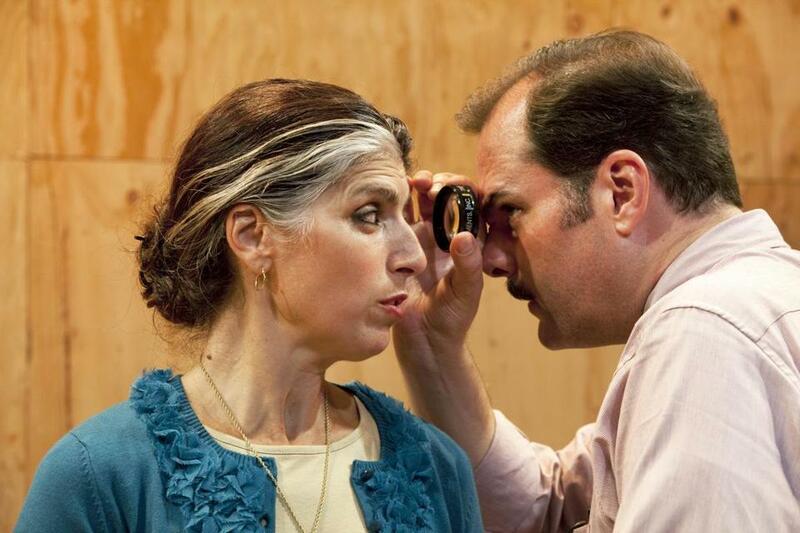 The eyes are the window not just to the soul but to the psyche in “Vision Disturbance,’’ Christina Masciotti’s deceptively disarming play about two damaged people who are thrown together when one is called upon to heal the other. But which one? On the surface, “Vision Disturbance’’ rides a quirky, offbeat charm, but there are mysteries and riddles under that surface, deftly teased out in this absorbing production by the New York City Players, directed by Richard Maxwell and presented by ArtsEmerson at the Paramount Center Mainstage. The set by Adrian W. Jones is spare: one large piece of plywood for the floor, one for a wall. Within that space, Maxwell alters the spatial relationship between Mondo and Dr. Hull so that in one scene, they might be seated in chairs on opposite sides of the stage, as far from each other as they could possibly be, while in another, they are literally cheek by jowl. Dr. Hull counsels music therapy for Mondo’s eye disorder, asserting it will help release the tension he believes is causing her problem. (“I know I’m supposed to reduce my stress, but it raises my stress to know I have to reduce my stress!’’ Mondo exclaims, giving voice to a universal quandary). He recommends that she attend classical music concerts and resume playing the piano, and he urges her to vent her frustration by banging on a cymbal in his office. She does. But it is Greek music Mondo longs for; she loves how it carries the entire history of a nation and a culture, and she is puzzled by the lack of American songs about Washington or Roosevelt. At another point, she admits that she fears the end of her marriage might erode her Greek identity. As she confides details of her unraveling life to Dr. Hull, it’s clear that his interest in Mondo is moving beyond the purely professional. It becomes equally evident that the good doctor has some major issues of his own. Tall, balding, attired in a shirt and tie, he presents an outwardly professional mien, but he’s been knocked around by the world no less that Mondo – with far fewer inner resources to draw on than she has. “I feel like I’m made of rubber and mush for brains,’’ he says mournfully. It’s impossible to imagine Mondo describing herself that way, for all her travails. There’s nothing orthodox about these characters or the touching bond that grows between them. “Vision Disturbance’’ was the first production in a program launched by the New York City Players to produce works by “early-career experimental playwrights.’’ Good choice: Masciotti is a writer of promise, not least because she understands that there is no single way of seeing.